If you’re anything like me, you have senior moments even in your twenties. I will sometimes forget where I placed something that I had in my hand like 5 minutes prior. The excuse I give myself is that I have so much going on in my head that forgetting the insignificant things doesn’t matter. Good enough for me. Leave it to Professor Yasuo Kuniyoshi at the University of Tokyo to come to my rescue. 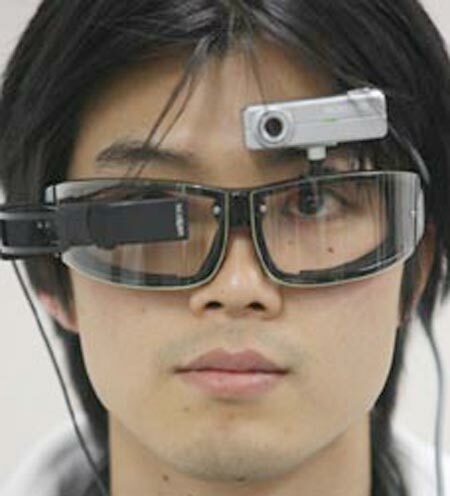 He has developed what he calls Smart Goggles that remembers where you last saw an item. His glasses have a built in camera, display screen, and a computer system that catalogs items in a database. First, you must go around the room identifying items that you have a habit of losing. When the computer focuses on an item, you are prompted to name the object, which you can say aloud. The computer records the audio and associates it with the current item. When you need to find that item again, just say the name, and the system will search the database and playback a video of where the item was last seen. Kuniyoshi has already successfully demonstrated the system with 60 different items ranging from CDs, mobile phones and even a potted begonia. Kuniyoshi has a background in artificial intelligence, and is the head of the Laboratory of Intelligent Systems and Informatics. His Smart Goggles takes advantage of A.I by learning from its mistakes. If you say an item, and it gets the result wrong, it fixes the bad association in its database. The Smart Goggles are still in a prototype stage, and is currently being refined. Right now, a bulky backpack housing the computer must be worn. In time, Professor Kuniyoshi hopes that these goggles will be useful for those suffering from dementia or Alzheimer’s disease.